Leesburg is in Loudoun County in the Northern Virginia region of Virginia. It was where Dolley Madison stayed after escaping Washington, D.C., during the War of 1812. She took with her important documents and portraits of America's early leaders, so as they would not be destroyed by the British. 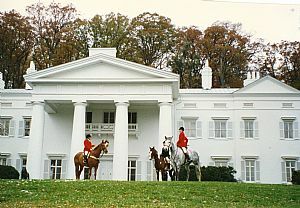 Leesburg has 18 national properties on the National Trust for Historic Preservation, such as Oatlands Plantation,a Greek Revival home built in 1803 by land baron George Carter, and Morven Park, once home to two governors, but it also includes the Museum of Hounds and Hunting, the only foxhunting museum in the world!